Coca-Cola company is simply incorrect in their statement: Calories in equal calories out is the physics formula that many have incorrectly used to describe how to lose weight. In Coca-Cola’s world, almost any calorie is fine, if you expend the energy. That is not the case. It is not a simple matter of taking in and expending calories, it is a matter of what you do with those calories once you have them. We blogged about fructose as a health issue and you can read that by clicking here. To summarize the scientific communities findings: fructose is not metabolized by the body or used as an energy source, and about 1/3 of it will be metabolized to fat. 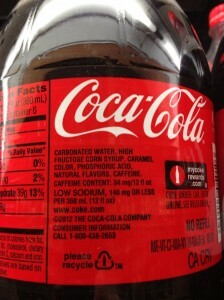 Fructose is half of what makes up table sugar, and 55% of the high fructose corn syrup that Coke puts into its sugared drinks in the United States. This is not simple energy expenditure- one cannot simply exercise off the calories from coke by expending the 140 calories per can, one must mobilize fat stores in order to get rid of the fat that is stored there. Other effects of fructose include include short-circuiting the system for appetite suppression and insulin production (all bad). Fructose in nature is complexed with fiber, so that it is not easily absorbed into the bloodstream. Fructose that has been purified, such as in table sugar, or high fructose corn syrup, is not complexed with fiber, and will be absorbed quickly by the intestine. As a weight loss surgeon, we see free sugar, particularly fructose, as a major problem with obesity in the United States. 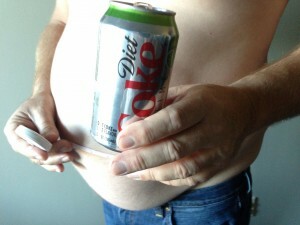 In my practice we tell our patients that soda is something we want them to give up entirely. Not only those drinks that have sugar or high fructose corn syrup, but also the sugar free variety. Obesity is on the rise, which is good for we weight loss surgeon’s. Increasing obesity, as happens when people take too much fructose, does mean we will get to study obesity more. But the answer, as Coca-Cola implies, is not a matter of energy expenditure – it is a matter of an ingredient, fructose, that does more than put passive calories into the body. Brand appearances for most food industry companies, except for Coca-Cola, are relatively rare during prime-time programming with large youth audiences. Coca-Cola has pledged to refrain from advertising to children, yet the average child views almost four Coke appearances on prime-time TV every week. This analysis reveals a substantial, potential loophole in current food industry self-regulatory pledges to advertise only better-for-you foods to children. MYTH: You will lose weight if you use artificial sweeteners. People who use artificial sweeteners tend to overeat. The issue with artificial sweeteners is they have a sweeter taste than sugar, and to balance that sweet taste people tend to eat more. Rats whose feed was supplemented with artificial sweeteners had an increase in appetite, which resulted in weight gain. We are not rats, but avoiding an overly sweet taste is important. It is no accident that while many of my weight loss patients consume large quantities of diet cola, they still consume a lot of calories to go with it. When my patients stop consuming soda, they lose more weight. For our patients we recommend they make their own drinks- including smoothies. A wonderful alternative to artificial sweeteners in smoothies is blueberries, which are a great natural sweetener – meaning the fructose is complexed with fiber so absorption is less. You can buy glucose – it is called dextrose. If you want a healthier sweetener, dextrose is it. But since it is less “sweet” it is doubtful that coca-cola will put it into their drinks anytime soon (its about 70% as sweet as table sugar). The problem is not a matter of “moderation.” Although moderation is a good step, and we applaud what Bloomberg did in NYC. Clearly getting rid of junk foods in schools works (see that link here). Coke advertising to fight obesity is like tobacco companies advertising about fighting lung cancer. By providing the substrate to make more of it, they give more opportunity to find expensive ways to combat it (like surgery). Prevention, avoiding these drinks in kids, limiting consumption in adults, and avoiding them in anyone who is obese, would be a start. Advertising that we need to move more to make up for the 140 calories is not only incorrect, it is false advertising. Artificial sweeteners have been found to change some brain functions that increase eating behavior. Increase in artificial sweeteners increase obesity in rodents. Artificial sweeteners and their relationship with weight gain in teens. Every year you hear about how kids who eat a lot of sugar are my hyper than kids who don’t. In spite of study after study showing this isn’t the case. My favorite study showed that if mom’s rate their kids more hyper if they think their kids got sugar. Still, these ideas persist. One thing is clear, that when kids eat more junk food, they tend to be more hyper – it is difficult to determine if that is kids being left alone to eat out and they eat junk, families not eating together and sitting down at a meal – either way do yourself and your kids a favor: learn to cook, eat at home, spend time with your family. Fructose may be more of a problem than we thought. When people are placed on a high fructose diet there is an increase in fat deposited in the liver, an increasing level of VLDL – very low density lipoproteins, which is major risk factor for heart disease, and increased insulin resistance. The increase in uric acid deposition is one of the reasons that when some people get “off sugar” their joints feel better. High Fructose Corn Syrup is sweeter than table sugar, and contains more fructose (fructose tastes sweeter). It is not the “equivalent” of sugar, and that extra fructose adds to the problems. When rats are fed diets that use HFCS instead of sugar, they gained more weight, more weight in the abdomen, and increased levels of serum triglycerides. In another study, rats who were deficient in omega-3 fatty acids but fed on a high fructose diet did not repair their brain as well. So when the corn industry says that high fructose corn syrup is about the same as table sugar I have two answers: (a) no one said that table sugar is good for you and (b) the studies are clear that the extra bit of fructose in high fructose corn syrup has a bad effect on people’s weight, heart, and brain. Cooking your own food, relying less on processed foods, means you won’t have this in your diet. Think about it this way: that extra fructose you have per day may not be much, but it adds up. Drinking one 48 ounce sugar filled drink a day leads to 10 pounds in a year of fat from fructose alone, or two 12 ounce cans leads to 5 pounds a year. That is just fat- not the extra calories that your may store with it. Add the high fructose corn syrup up in all you eat, and it is easy to see small weight gain over the year. A review article about fructose and how the refined version has correlated with the risks of obesity, diabetes, and cardiac disease. Fructose contributes to fat in the liver – sometimes we call it fatty liver disease. This is more than a cosmetic issue, as fatty liver can progress to fibrosis which is scar, and this is cirrhosis. Fatty liver has now become the number one cause for needing liver transplants. Daily fructose ingestion was found to lead to increase fibrosis (scaring or cirrhosis) of the liver. Below is an analysis of prime time television and the increasing product placement of Coca-cola, in violation of their own policy. Does Seasonal Affective Disorder Affect the Elderly?